Your Disneyland purse, bag, daypack or backpack is the most important thing you take to the park. What's inside it can mean the difference between having fun all day and a total meltdown. The bag itself is also important. And finding your perfect bag or backpack isn't easy. That's why I'm here to help. This article is based on visiting several times a year for nearly two decades, and making every mistake you can imagine. These tips may help you avoid some or most of them. Keep your bag on the small side and resist the urge to take too much. You'll walk about a mile for every hour you're in the park. Lugging too much weight around is simply exhausting. I've seen people sagging under the load of a backpack that must weigh 20 pounds, looking miserable and tired - and that's not much fun. Instead, put some of your items into pockets with Velcro closures or zippers. Take out everything out of your wallet that you don't need in the park: store discount cards, your gym pass, your work ID and anything else that isn't essential. If you can't resist bringing a lot with you, don't carry it around all day. Instead, rent a locker and stow it there. If you're park hopping, use the lockers in the entry plaza for easier access. Put your extra jacket in there, along with your change of clothes, spare socks and other things you're taking "just in case." There's a better way to handle your purchases. If you're staying at a Disneyland Resort Hotel, you can have your purchases sent directly to the hotel. Otherwise, you can ask where to leave your packages and then pick them up later near the entrance. Get something you can hold onto. Otherwise, you could end up as embarrassed as the person who created this news item in August 2016: "Riders on California Screamin' became stuck for about 45 minutes the other day when a passenger's purse flew out of her hands and became wedged." How big? Your bag will have to fit into the ride vehicle seat back pouch on a few rides. Indiana Jones has the smallest bag storage spot, which is just big enough for a medium-sized sling bag when it's half full. How many pockets? To get through security quickly, choose something with a few pockets that are easy to see into. Lots of compartments may sound like a good idea at first, but if you don’t remember what you put in them, it can slow you down all day. Instead, opt for fewer pockets and use Ziploc bags to keep things separate. If you like a messenger bag, choose one without a flap for easier access. A bag with a few dividers will keep you from spending far too much time digging around in it for things. If you're a minimalist: Try a passport pouch, ID holder or small wallet with a strap may be all you need. A wallet with a strap may be safer than putting it in a pocket where it can fall out, as long as the strap is well made and secure. And it's easier to get into when you need something. A lot of people recommend the small Baggalini cross body bag which has lots of pockets and zippers, room for cards, ID and money. Although you don't need to worry much about theft at Disneyland, the similar Pacsafe crossbody bag has a strap that can't be cut and might be more useful all around - even though it has fewer pockets. Backpacks and fanny packs get in the way when you're boarding rides. And an adult carrying a full backpack could easily smack a shorter person in the face with it if they turn too quickly. Some regular Disneyland visitors say they always take a backpack - but they may also have a stroller and don't have to carry the weight all day. Others say backpacks are too hot, cumbersome and annoying to have for rides. Just Right: A medium-sized sling bag is my Disneyland favorite. You can move it to the front of your body when you get on rides, and they're easy to get into while walking. First-time visitors often make the mistake of sticking their tickets into a random pocket of their bag and then spend a few panicky moments trying to find it when they need to get a FASTPASS or hop over to the other park. Unless those tickets go into a pocket by themselves, they're also easy to lose, falling out when you take something else out of that same pocket. Instead of all that panic-provoking risk, you can use a lanyard to stow your tickets. For something slightly less dorky-looking, get a luggage tag. You need one that has an open slot on the end so you can slip things in and out without removing the strap. Attach that to your bag and use it for tickets and FASTPASSES. All bags are subject to search. When you go through the security check, they will ask you to open all zippers and pockets. They may use a stick to move things around inside to get a better look at what you have. Disneyland's policies say suitcases, coolers or backpacks larger than 18" by 25" by 37" are prohibited. So are bags with wheels of any size. 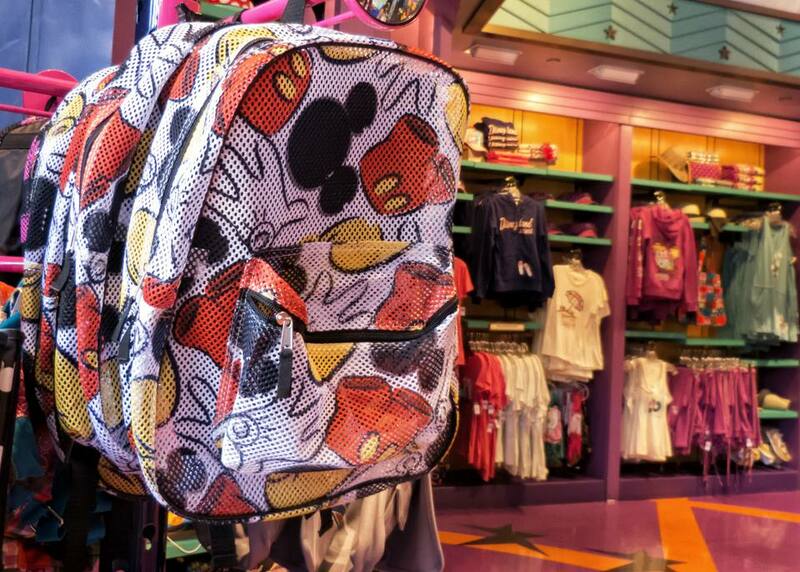 You may be going to Disneyland for a day trip and your backpack is all you need. If you're staying longer and need to know what to pack, check the girls' guide to what to pack for Disneyland.